A morality play set amid the moral quagmire of contemporary Kashmir, Sikandar does the one thing unforgivable for a film concerned with ethical accounting: absolve the hero of ultimate responsibility for his actions. Actually, Piyush Jha’s Hindi-language drama gets into trouble well before its final payoff, relying heavily on an oversimplified moral calculus for at least its first half. But it’s the conclusion, allowing the eponymous protagonist to achieve his violent ends without dirtying his hands, which renders moot most of what came before. 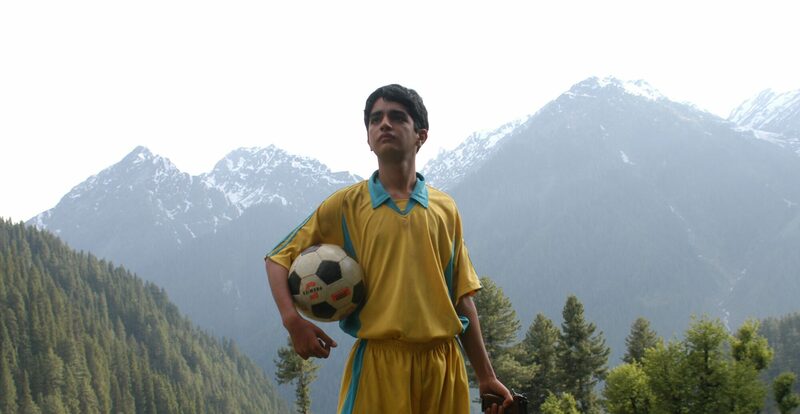 His parents having been killed in a wave of terrorist violence, 14-year-old Sikandar (Parzan Dastur), a young soccer-loving Muslim, lives with his aunt and uncle in the Kashmiri countryside. Picked on by fellow schoolboys for being a “sissy,” he stumbles across a discarded pistol on the walk to school one day and begins waving it at anyone who threatens his peaceful existence. Soon the local Islamic militants take notice and, falling under the influence of a charismatic leader, Sikandar begins training with his new mentor. Despite the protestations of his school chum, Nasreen (Ayesha Kapoor). who chides him that “that gun has become part of you,” and his uncle, who scoffs at his notion of the necessity of “fighting for peace,” the boy throws in his lot with the jihadists and accepts an assignment to assassinate a local militant-turned-nonviolence-advocate. Up to this point, the film seems like a fairly cut-and-dried morality tale (our hero having to make the choice whether to give in to his violent propensities or return to his law-abiding ways), but when Nasreen shows up to prevent the assassination and Sikandar inadvertently kills the militant leader instead, the film shifts gears dramatically. With the boy on the run, the picture moves into a low-grade—and not particularly suspenseful—chase narrative, while simultaneously widening its scope to implicate the range of Kashmiri institutions (the army, local politicians, militants) in the endless cycle of violence visiting the region. Moving beyond the more simplistic “let’s have peace” notions of the film’s first half, the second act suggests some of the reasons why such sentiments are not so easily achieved. But it all crumbles under the weight of the finale, when a silly revelation about two of the film’s principal characters forces a complete reassessment of the preceding narrative and forces Sikandar into another ethical quandary—exactly mirroring the setup of the botched assassination attempt as well as echoing the conclusion of Chinatown. And once more Nasreen steps in to take charge of the situation and keep Sikandar’s hands clean—or at least cleaner than they might have been. Still, despite the too-neat working out of the immediate conclusion, Jha leaves the viewer with a sense of the ultimate impotence facing those who would take larger action in the face of widespread hatred and official corruption. The film’s penultimate shot finds the director craning up from an isolated bridge, the two young students huddled together on its planks, tiny, helpless figures lost in the widescreen frame. Forget it Jake, the image seems to say, it’s Kashmir.